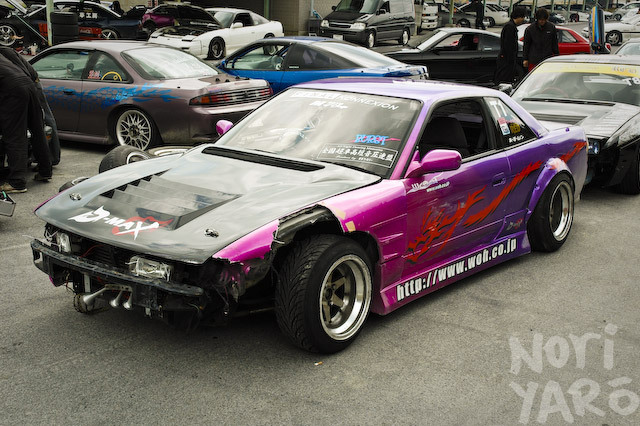 I posted some of these photos back in 2006 on a couple of drifting forums, and some people promptly took them, watermarked them and posted them on their own websites. 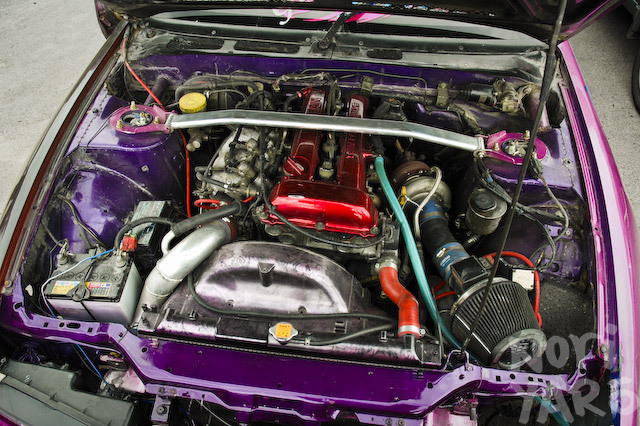 Now that Noriyaro is up and running though, the rest of the until now unseen photos have a place to be shown. These are, of course, photos of Team Burst, one of the most impressive drift teams of recent years (the award for all time greatest drift team has to be Marionette, but we’ll talk about that another time) taken back in 2006 on Meihan Sports Land’s E-Course, not the C-Course as seen on most of the videos from Meihan, where Burst does their wall-scrapingly best. That didn’t really matter though, as the guys from Burst and Gloss Factory were doing some extremely close driving that day, both to the walls and each other, leaving a trail of rubber shreds, fibreglass and zipties in their wake. The guy in the red shirt with trademark bleached hair is Naoki Nakamura, Burst’s leader. 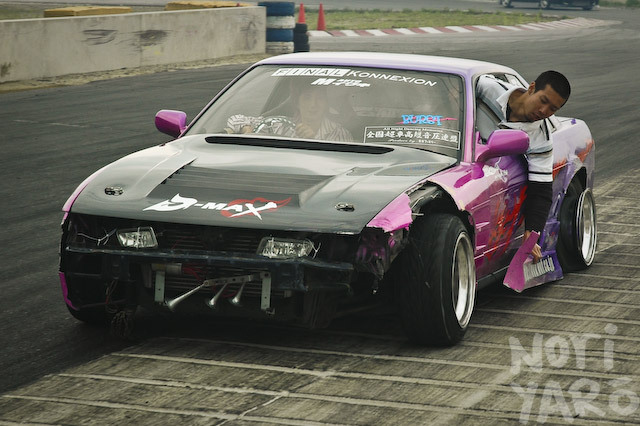 He’s a very friendly and approachable guy, which makes it even easier to appreciate his drifting skills. 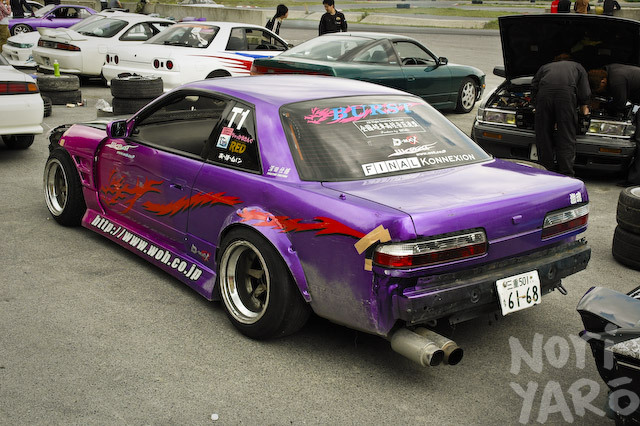 Since these photos were taken, he has moved into D1 competition, driving a Koyorad-sponsored white S15 Silvia. A note to any person that is considering building a gokart-sized track in the near future, and would also like to use their track for drifting for extra revenue, but is worried about how drift cars might damage the edge of the track, rip up their grass and dig ditches in their dirt. Take a look at this picture; see how the concrete edge of the track has small divots running perpendicular to the track? This is useless for go-karts to drive on (meaning the intended racing line on the track is maintained), but perfect for drifters who don’t really care about that sort of thing. I love Team Burst. 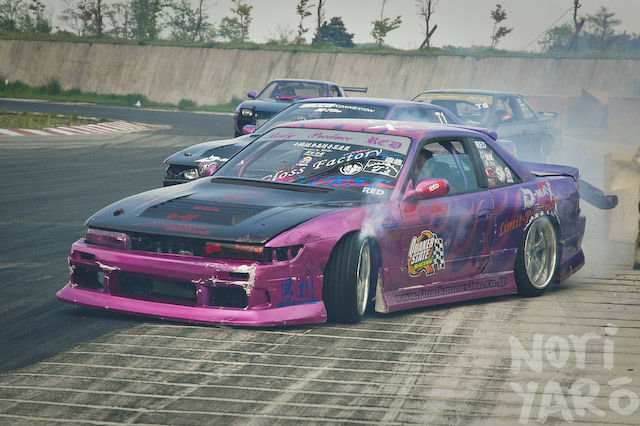 spesh when Naoki did that massive drift in the MSC round in 2006? on E course every one else went to feint the other way to make it to the next corner under drift but he just came in so fast and got it in one slide. my favourite driver in Japan. wow man you took those photos?? thank you for the pictures and i’ll be sure to link to your page any time i see your pictures! Been waiting for these pics !!! more pics of that clear hitman steering wheel!!! why cant we have teams like this in new zealand! seriously doesnt get any cooler than this. Dude you are single handledly responsible for all the rampant Burst fanboyism on the internet. I’d say that Burst themselves have more to do with that, but I was there at an especially good time. Thanks to Mr L for driving me out to Meihan that day. can you make a wall paper of the pic of the wheel in the preview post?